The new LFC-V Liquid Food Composter offers greater cleanliness, reliability and tracking capabilities, allowing commercial kitchens, food resellers and other food handlers to reduce disposal costs and environmental impact with greater efficiency and convenience. The lid of the new composter is a proprietary design that remains open at any desired angle without the use of gas struts and latches that commonly collect food waste, create hygiene problems and are difficult to clean. "The lid and access opening of the new LFC-V are free of any protrusions where bits of waste typically become lodged, allowing personnel to simply sweep any spills into the rimless opening of the composting vessel and easily keep the entire area clean," explains Iain Milnes, president. The all-stainless-steel machine is also equipped with an integral hose to clean the interior and exterior, as well as bins or buckets used to transfer food waste, enabling operators to maintain hygiene with minimal effort. All Power Knot composters can be connected to the internet to monitor the amount of waste digested per hour, day, week, month and year, as well as the number of times the lid is opened during these periods and the amount of CO2 diverted from landfills. The LFC-V composter upgrades from a 32-bit to a 64-bit platform for improved processing speed and archiving of data. In the event an internet connection is lost, the system can save two years of data and upload it as soon as the connection is restored. Also called a "bio-digester," the machine uses natural microbes and enzymes, along with automated infusions of hot and cold water in the presence of oxygen, to aerobically turn solid food into liquid that drains continuously into ordinary municipal waste piping. Food waste can be added to the unit at any time, and requires about 24 hours to become wastewater. According to Milnes, Power Knot is the world's leading producer of liquid food composters with more units sold into more countries than any competing product, and is the only LFC manufacturer offering a 3-year comprehensive warranty as standard. The new SBT Bin Tipper is used to load waste from a roller or wheelie bin into the composter. Constructed of stainless steel, completely waterproof and hygienic for kitchen use, it can lift bins up to 140 litres (40 gallons) weighing up to 90 kg (200 lb) and can be supplied to lift US bins compatible with ANSI standard Z245.60 or non-US bins compatible with EN 840. The battery-powered unit can lift approximately 500 bins before being recharged overnight by plugging its integral waterproof charger into a standard 110 V to 240 V outlet. At only 800 mm (31.5 in.) wide and mounted on casters, it can fit through standard doorways, making it easy to retrieve skips and bins containing food waste from various areas of the facility, and to roll the unit outdoors for washing. Safety is assured by requiring the operator to use two hands for operation. Optional single- or double-side guards and a door are also available for enhanced operator protection. 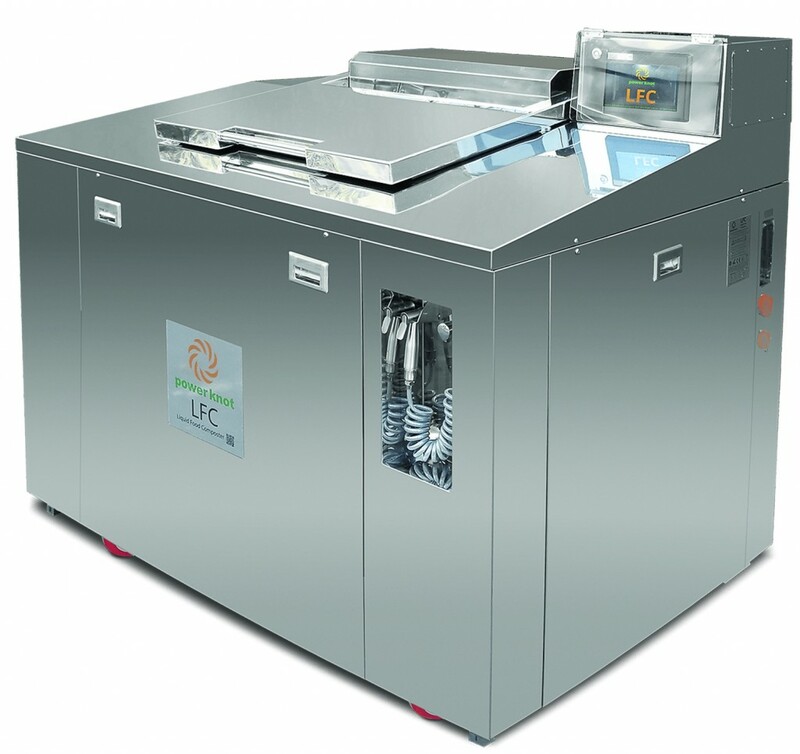 LFC-V Liquid Food Composters are available in six sizes to digest from 20 to 1000 kg (45 to 2200 lb) per day. Along with the SBT-140 Bin Tippers, they will be on display at WasteExpo 2018, booth 1245, and available for purchase starting July of 2018. The SBT Bin Tipper is used to load waste from a roller or wheelie bin into the composter. Constructed of stainless steel, completely waterproof and hygienic for kitchen use, it can lift bins up to 140 litres (40 gallons) weighing up to 90 kg (200 lb) and can be supplied to lift US bins compatible with ANSI standard Z245.60 or non-US bins compatible with EN 840. LFC-V Liquid Food Composters are available in six sizes to digest from 20 to 1000 kg (45 to 2200 lb) per day, and start at US$17,300. SBT-140 Bin Tippers start at US$7,500. Both will be on display at WasteExpo 2018, booth 1245, and available for purchase starting July of 2018.